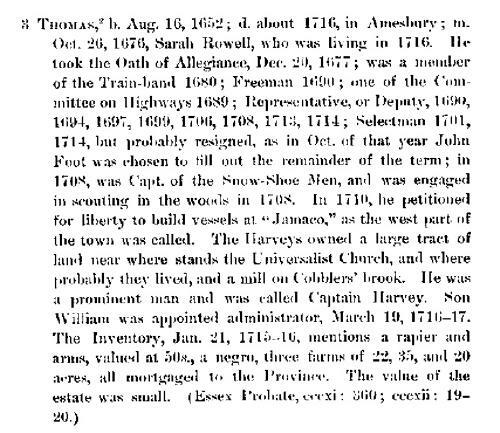 John Harvey Treat, Ancestry of Col. John Harvey, of Northwood, New Hampshire, , at https://books.google.com/books?id=X-RFhIEDq2MC . Boston: T. R. Marvin & Son, (1907) , p. 14. William Harvey was born perhaps about 1626. Town and City Clerks of Massachusetts, Massachusetts Vital and Town Records, Provo, UT: Holbrook Research Institute (Jay and Delene Holbrook), , Lawrence > Births, Marriages and Death > 397. 1930 United States. Bureau of the Census. 15th census, United States, 1930 federal census : population schedules ; NARA microfilm publication T626, Washington, District of Columbia: Bureau of the Census Micro-Film Laboratory, ([19--?]) , Census Place: Concord, Merrimack, New Hampshire; Roll: 1304; Page: 5A; Enumeration District: 19; Image: 776.0; FHL microfilm: 2341039. Sixteenth Census of the United States, 1940, Washington, D.C.: National Archives and Records Administration, (1940) , Census Place: Hillsborough, Hillsborough, New Hampshire; Roll: T627_2288; Page: 9B; Enumeration District: 6-20. 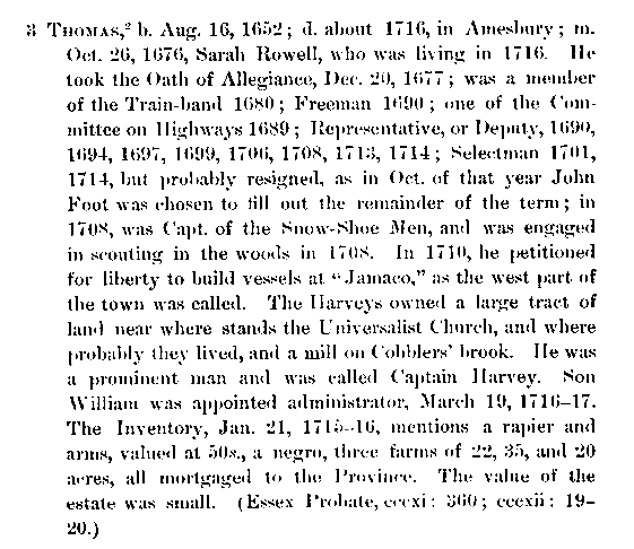 "New Hampshire, Deaths and Burials, 1784-1949," index, FamilySearch (https://familysearch.org/pal:/MM9.1.1/FDK5-1F8 : accessed 04 Dec 2012), Albert E. Hatch, 01 Aug 1940; citing reference , FHL microfilm 2295720. "Massachusetts Births, 1841-1915", database with images, FamilySearch (https://familysearch.org/ark:/61903/1:1:FXX3-RVJ : 1 March 2016), Bertha F. Hatch, 1895. "United States Census, 1910," database with images, FamilySearch (https://familysearch.org/pal:/MM9.3.1/TH-1951-23035-2180-55?cc=1727033 : 11 November 2015), Massachusetts > Middlesex > Lowell Ward 3 > ED 1954 > image 11 of 14; citing NARA microfilm publication T624 (Washington, D.C.: National Archives and Records Administration, n.d.). "New Hampshire Birth Records, Early to 1900," database with images, FamilySearch (https://familysearch.org/ark:/61903/1:1:FLG3-SYH : 12 December 2014), Harry A S Hatch, 24 Apr 1885; citing Concord, Merrimack, New Hampshire, United States, Bureau of Vital Records and Health Statistics, Concord; FHL microfilm 1,001,006. "Massachusetts Marriages, 1841-1915," database with images, FamilySearch (https://familysearch.org/ark:/61903/1:1:N48W-K8X : 17 February 2016), Harry Augustus Hatch and Harriet Isabel Haskell, 17 Mar 1906; citing Providence, , Rhode Island, United States, State Archives, Boston; FHL microfilm 2,315,298. "New Hampshire Birth Records, Early to 1900," database with images, FamilySearch (https://familysearch.org/ark:/61903/1:1:FLG3-3QW : 12 December 2014), John B Hatch, 24 Apr 1885; citing Concord, Merrimack, New Hampshire, United States, Bureau of Vital Records and Health Statistics, Concord; FHL microfilm 1,001,006. "New Hampshire Marriage Records, 1637-1947," database with images, FamilySearch (https://familysearch.org/ark:/61903/1:1:FL6L-CXK : 12 December 2014), John E. Hatch and Susie A. C. Boardman, 01 Jun 1884; citing Concord, , New Hampshire, Bureau of Vital Records and Health Statistics, Concord; FHL microfilm 1,001,269. "New Hampshire Birth Records, Early to 1900," database with images, FamilySearch (https://familysearch.org/ark:/61903/1:1:FLG3-QQV : 12 December 2014), Mabel Florence Hatch, 05 Jan 1888; citing Concord, Merrimack, New Hampshire, United States, Bureau of Vital Records and Health Statistics, Concord; FHL microfilm 1,001,006. "Massachusetts Births and Christenings, 1639-1915," database, FamilySearch (https://familysearch.org/ark:/61903/1:1:F45L-JQJ : 4 December 2014), Rena Edna Hatch, 26 Sep 1903; citing Lowell, Middlesex, Massachusetts, 98-1123; FHL microfilm 2,257,033. Vital Records of Wenham, Massachusetts to the end of the year 1849, Salem, Mass. : The Essex Institute, (1904) , Vol. 2, p. 461. "Maine, Births and Christenings, 1739-1900," index, FamilySearch (https://familysearch.org/pal:/MM9.1.1/FW1S-J3N : accessed 28 Oct 2012), Bethany Hayes in entry for Amanda Jane Hayes, 20 Jun 1831; citing reference 35, FHL microfilm 11588. FamilySearch Pedigree Resource File, , Submitter: Ronald G. RUSCHE, 3675 South 2200 West #28 West Valley City, Utah 84119.